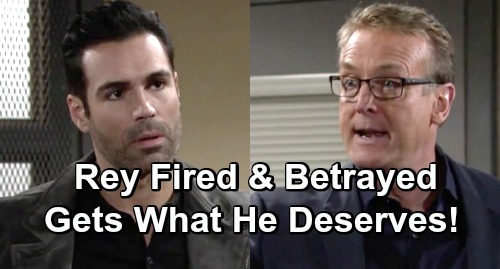 The Young and the Restless (Y&R) spoilers tease that Rey Rosales (Jordi Vilasuso) will suffer the consequences. He knew he was taking a huge risk by helping Billy Abbott (Jason Canela) and Nick Newman (Joshua Morrow) with their plan, but he was willing to do it for Sharon Newman’s (Sharon Case) sake. Rey truly loves Sharon and wanted to fix the legal jam he helped set in motion. However, even risks with rewards can come at a price. The Young and the Restless spoilers say Paul Williams (Doug Davidson) will finally make his long-awaited Y&R return next week. He’ll do it in style when he fires Rey, presumably for his part in the escape plot. Paul thought Rey was a by-the-book kind of guy, but he’ll realize he misjudged him. Rey will be forced to hand over both his badge and his gun. It’ll be interesting to see where Y&R takes Rey’s character next. Will he eventually be reinstated or perhaps head down a new career path? Will they start nudging him toward the exit door instead? Regardless, this GCPD firing is a longtime coming. Rey may be trying to help now, but he’s not the saintly detective he’d have everyone believe he is. From the moment Rey came on the scene, he’s been an “act now, ask questions later” kind of guy. Rey almost shot poor Tessa Porter (Cait Fairbanks) on the Newman property after mistaking her for a prowler. Then, he was convinced Nick Newman (Joshua Morrow) had something to do with J.T. Hellstrom’s (Thad Luckinbill) disappearance. Rey’s always so smug, even when he’s dead wrong! Of course, Rey also deceived Sharon from day one and eventually broke his promise to protect her after her confession. He shouldn’t have been making promises he couldn’t keep. As the icing on the cake, Rey had the nerve to cover up Mia Rosales’ (Noemi Gonzalez) vicious attack on his own sister. Lola Rosales (Sasha Calle) nearly died because of Mia, but Rey kept quiet for the sake of a fake baby – which may actually be Arturo Rosales’ (Jason Canela) kid now thanks to a rewrite. It’s nice that Rey’s trying to clean up the mess he made for Sharon, but is it too little, too late? Regardless, The Young and the Restless spoilers say Rey’s going to pay big time through the loss of his job and some deep betrayals. Are you eager to see Paul lay down the law with Rey? Does he deserve to be booted from the GCPD? We’ll give you updates as other Y&R news comes in. Stay tuned to the CBS soap and don’t forget to check CDL often for the latest Young and the Restless spoilers, updates, and news. The Young and the Restless Spoilers: Which Coverup Crew Member Made the Biggest Mistake In the J.T. Case?